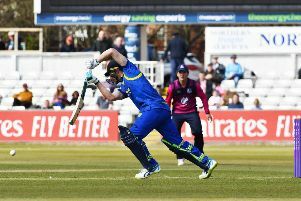 Skipper Paul Collingwood has hailed Durham’s resilience – after the news of Mark Stoneman’s impending departure for Surrey. “It’s been a tough few days because we never want to see a good player leave,” said Collingwood after inspiring yesterday’s four-wicket Royal London One-Day Cup victory over Warwickshire at South Northumberland Cricket Club’s Gosforth base. “We always seem to be battling adversity in some way, but we always respond to it well. “The club is going through a hard time and I want to help them out it. Collingwood, back as one-day captain replacing Stoneman, led his team to within sight of victory by thrashing 53 off 33 balls. It ended a run of three limited-overs defeats, culminating in Sunday’s 170-run hammering at Northants prior to the announcement that Stoneman had signed for Surrey for 2017 and Phil Mustard had joined Gloucestershire on loan. Put in on an excellent pitch, the visitors were on course for 300-plus while century-maker Sam Hain (107 off 115 balls) was sharing a third-wicket stand of 143 with Tim Ambrose (two sixes in 86). But good bowling at the end of the innings by Usman Arshad, with 3-50, held them in check and they fell short on 292-7, despite three Laurie Evans sixes in a rapid 30. Keeper Stuart Poynter, making his competitive debut, took the catches which brought the only two wickets to fall in the first 41 overs, Will Porterfield first falling to Chris Rushworth in the third and Ian Bell edging the first ball of Scott Borthwick’s second over. Stoneman laid the platform for Durham’s chase with a solid 56 and then Borthwick built the momentum with two sixes in his 66 off 67 balls. Victory looked a formality when Collingwood pulled Chris Wright for two sixes and drove two fours in the 40th over to reduce the target to 61 off 60 deliveries. The captain went for one big hit too many in the 44th, slicing a Rikki Clarke slower ball to short third man, but Michael Richardson’s unbeaten 32 steered the Jets home. Durham are back in action tomorrow, needing a win at home to Derbyshire to stand a chance of qualification for the NatWest T20 Blast quarter-finals (6.30pm).